FINLAND: Google will buy all the power from an 81MW wind farm being developed in the south-east of Finland. The technology giant will use output from the 18-turbine Hedet project in Närpes to power its data centre in Hamina. Construction work is set to start by the end of 2018 and Hedet is expected to be commissioned by the end of 2019, majority owner Neoen stated. The French renewables developer owns an 80% stake in the wind farm, while German developer Prokon’s Finnish subsidiary owns the 20% balance. Turbine selection is currently under way, a spokeswoman for Neoen told Windpower Monthly. The 81MW, 18-turbine specification points to 4.5MW units being deployed. Hedet will be Neoen’s first project in Finland, but the developer added that there will be "more to follow". The company stated: "The Finnish government is an avid supporter of renewable energy and the country has excellent natural resources for wind power." Finland had 2,127MW of installed wind power capacity as of 1 September, according to Windpower Intelligence, the research and data division of Windpower Monthly. Google, meanwhile, aims to source enough renewable energy to power its entire global operations. It has previously signed power purchase agreements (PPAs) for wind power in the United States, Norway and Sweden. 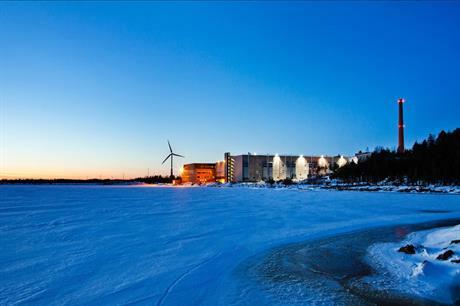 The Hamina data centre — a former paper mill on the shores of the Bay of Finland — already uses a sea water cooling system.